One aspect of Kings of War that I believe works really well are the Terrain rules. What I mean by that is that I think that the rules writers have got the impact and interaction of terrain with units pretty well set at the right level. As a person that has come from WHFB (and before that 40k), the specifics around terrain have always been an area where the balance has never been achieved. Both of the GW systems have swung wildly from where the rules overly impacted the game to that where they had little effect. In some cases different types were at different points along the spectrum within the same edition. Terrain has two main functions in my view. Firstly, it makes the game look so much better. 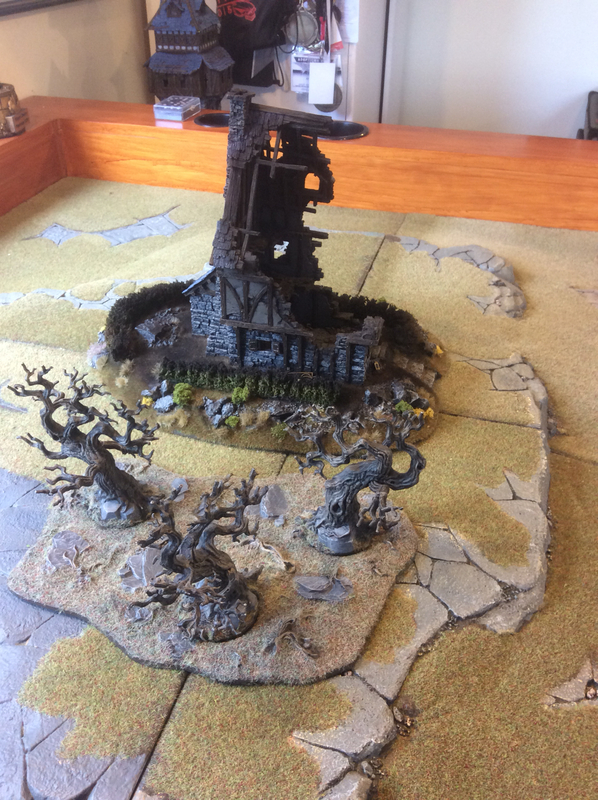 To me, the opportunity to play a game on a realistic backdrop enhances the experience as much as a well painted army or a nicely presented display board. It does however seem to be the arm of the hobby that is most easily neglected, unfortunately. The second function is to reinforce the strategic aspect of the game. Judicious use of terrain influenced by clear to understand rules makes a wargame so much more of a tactical challenge to participants. And it is here where I think KOW has got the balance right. KOW defines three (effective) classes of terrain and then uses a system of Heights that interact with army units. This two prong methodology allows an easy to understand classification system for terrain pieces by which players can make tactical decisions which reward considered analysis. Effectively using a category-classification (Obstacle, Difficult Terrain and Blocking Terrain) provides clarity in a way I have not seen used as well in other systems. Yes, it can be a bit abstract but it captures the clear function of terrain with the benefit of being easy to apply. Is it perfect? No, the Rules Committee have identified that the system would be better if it had a small shift in Height classification (they have suggested adding +1 to all Heights would make it more easily understood). There are other possible amendments that could potentially be added - combat modifier in relation to hills e.g. Charging downhill, charging uphill or possessing higher ground. Alternatively existing mechanisms such as Hindered might be applied in certain circumstances. Another area is possible building rules. However I acknowledge that there is a delicate balance between adding greater challenge against unnecessarily complicating the game. But overall I think that the authors have done a good job in making terrain meaningful without it being overbearing. And no discussion of terrain would be complete without a shout out to Epic Dwarf and their terrain maps. Though I'm a recent convert the density and setup of terrain in these maps really complement the game. Jokes aside, great blog, really appreciate the effort! Strangely enough before I started using maps we were probably using more terrain esp obstacles. one thing I miss from most terrain rules is the ability to stack terrain pieces on one another. place a wood or a building or an area of rough ground on a hill. Or you could allow roads and rivers to intersect and swamps and areas of marshland to join to the rivers. most rules seem to insist that terrain is separated by a nice clear 6 inch gap. to me this tends to produce unrealistic layouts.